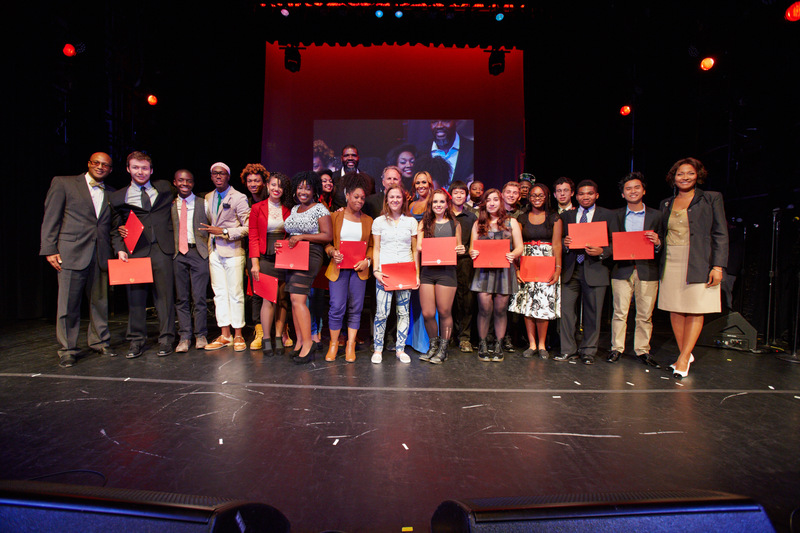 Over 200 Network members, music educators, and arts advocates came together in Los Angeles to discuss “Innovations in Youth Development,” the theme of this year’s Berklee City Music Network Conference. 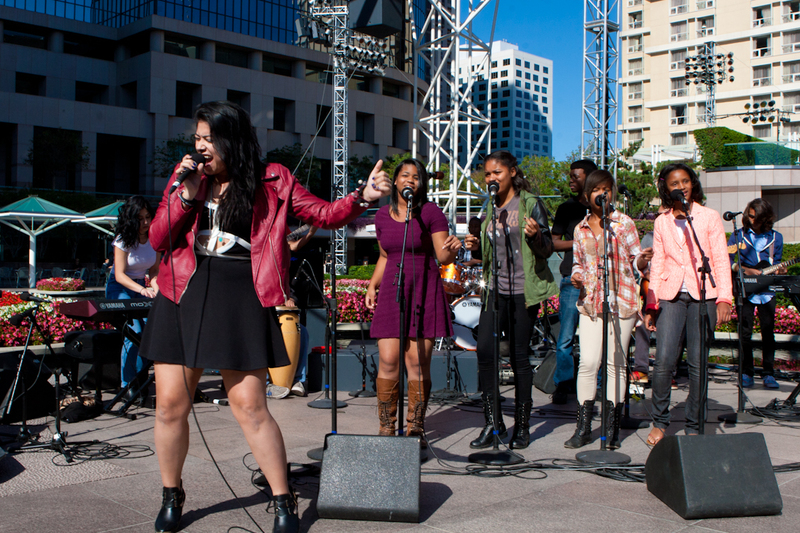 The conference kicked off on November 2 with “Youth Power-Up Day,” a free outdoor festival at Grand Performances, that featured performances by youth ensembles from around the country, a community drum circle hosted by Remo, and a jam session led by Kevin Eubanks. Attendees moved indoors to the nearby Omni Hotel for the next three days full of inspiring presentations, panel discussions, and interactive activities. BCMN Conference veteran Libby Chiu started each day with a networking workshop that featured special guests such as Jonathan Zeichner (APCH), Andy Davis, and youth ambassadors from A Place Called Home. ; and Ron Weisner’s all-star panel discussion about the music industry featuring Bill Withers, Gladys Knight, Bobby Colomby, Tommy LiPuma, Ray Chew, and Ricky Minor. The conference also featured a master class at the Grammy Museum; presentation by Network members such as Mike Anderson, Joey Arreguin, Gordon Cobb, Kevan Ellis, Greg Holt, Thomas Howard, Mark Kohler, Bethany Paulsen, Milton Ruffin, Ed Sublett, Frank Van Bree, and Cliff Weeks; plus a visit by the John Lennon Educational Tour Bus. With so many thought-provoking sessions, attendees left Los Angeles feeling inspired to further their work with young musicians. High school musicians don’t miss the Jam Session led by Kevin Eubanks at Youth Power-Up Day part of the Berklee City Music Network Conference, on Sunday, November 2. The jam session is open to current high school students, and in order to participate you must APPLY. The application will take no longer than 5 minutes. When: Sunday, November 2 from 12:00pm noon-5:00pm. At Youth Power-Up Day on Sunday, November 2, part of the Berklee City Music Network Conference, there will be a jam session with Kevin Eubanks, the former leader of The Tonight Show Band. The jam session is open to current high school students, and in order to participate you must APPLY (Click Here). The application will take no longer than 5 minutes. Bill Withers will join Ron Weisner on his panel on Tuesday, November 4 titled “The Challenges of Change: Remaining Fresh, Being Creative, Developing for Tomorrow’s Industries” with other guests Tommy LiPuma, Bobbie Colomby, and Ray Chew. Withers, originally from West Virginia, recorded a number of hits including “Lean on Me,” “Ain’t No Sunshine,” “Use Me,” “Just the Two of Us,” and “Lovely Day.” In 1967 he relocated to Los Angeles and financed his own demos, which led him to Sussex Records with Clarence Avant who got Booker T. Jones to produced Withers’ first album Just As I Am, which featured “Ain’t No Sunshine.” At the 14th Annual Grammy Awards in 1972 he won the Grammy for Best R&B Song for “Ain’t No Sunshine.” Prior to winning the Grammy the song had previously sold over a million copies and went platinum. In 1980 he released “Just the Two of Us” with saxophonist Grover Washington, Jr., which later went on to win a Grammy. In 2005 Withers was inducted into the Songwriters Hall of Fame and in 2006 received the American Society of Composers, Authors and Publishers (ASCAP) Rhythm & Soul Heritage Award presented to ASCAP members who have had a major impact on the legacy of Rhythm and Soul music. Don’t miss out on this great event and the opportunity to interact with Bill Withers and others at the Berklee City Music Network Conference in Los Angeles November 2-5. Engage in presentations and conversations with music industry and education giants including Terri Lyne Carrington, Ron Weisner, Tommy LiPuma, Lalah Hathaway, Kevin Eubanks, Patrice Rushen and Mark Slavkin. Student rate: We are giving away 25 free three-day passes to undergraduate and graduate students (passes are available on a first-come, first-served basis; RSVP to Christina Quarles). Undergraduate students are also eligible for a $25 per day rate. Schedule, registration and speaker bios are available on the conference website. Students from five of our Berklee City Music Network sites will be coached by leading industry artists, including Kenny Lattimore, Ashley Rodriguez, Shoshana Bean before performing on stage that evening for a panel of clinicians. Limited seating is available at the Clive Davis Theater, and therefore admission can only be guaranteed to the first 100 Conference registrants. Tickets are free with registration for attendees who register for 3-day passes or with a single day (Monday). Be sure to register early to secure your seat! Check out the highlights from last year’s BCMN Conference Master Class. We are offering FREE registration to the first 25 undergraduate and graduate college students who register to attend the Berklee City Music Network Conference in Los Angeles, CA from November 2-5. After the first 25 FREE registrations are given it is ONLY $25 per day for undergraduate and graduate students. Make sure you use your “.edu” email address to receive the discount. Don’t miss out on this great event featuring music industry experts, nonprofit leaders, accomplished music educators, and Grammy-Award Winning artists.